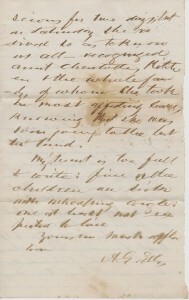 Marriage of Albert G. Ellis to Eliza C.J.L. Breuninger, 19 August 1847, Brown County, Wisconsin, Marriages, Vol. 1:22, Wisconsin Historical Society..
Eliza Breuninger, my great-great-grandaunt, was the second wife of the well-known Green Bay, Wisconsin, pioneer Albert Gallatin Ellis. She was also the sister of my great-great-grandfather, Louis Breuninger (1819-1890). 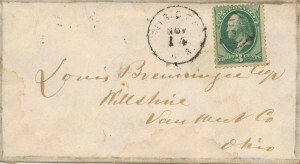 Had it not been for the letters and documents saved by my ancestor Louis Breuninger (which I refer to as “The Breuninger Collection”) I may never have discovered the Breuninger/Ellis connection. In The Collection is Louis’ baptismal record which names his parents, Johann Martin Friedrich and Sophia Carolina (Pfaff) Breuninger, and that Louis was born in Bachlingen, Kingdom of Württemberg. After I learned where the Breuningers lived I ordered a roll of the microfilmed church records of the Evangelische Kirche at Bachlingen from the local Family History Center. The Johann Martin Friedrich Breuninger family was entered in the Familienbuch section of their church records. From the Wisconsin Pinery, Nov. 15th 1872. 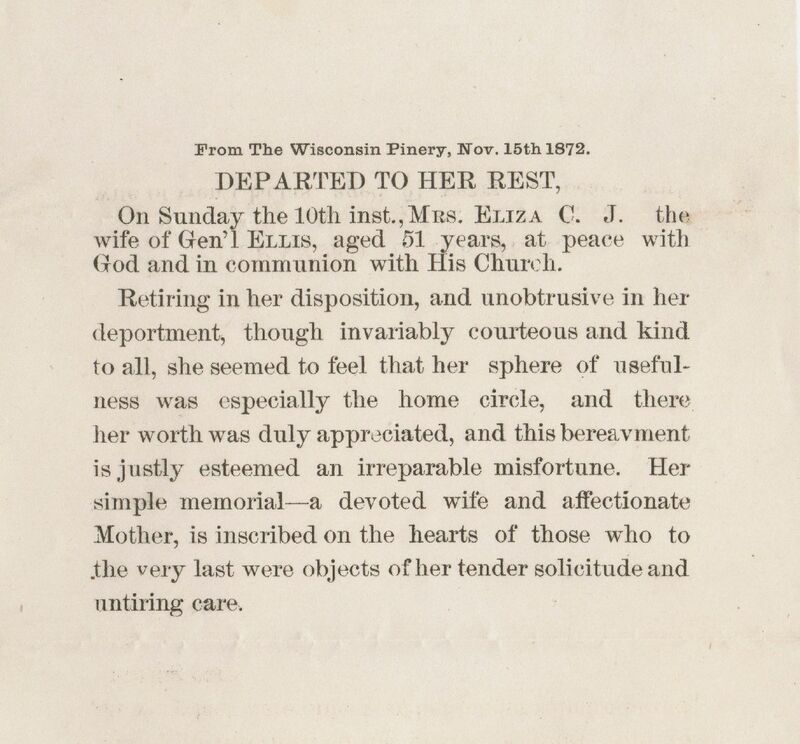 On Sunday the 10th inst., Mrs. Eliza C. J. the wife of Gen’l Ellis, aged 51 years, at peace with God and in communion with His Church. Retiring in her disposition, and unobtrusive in her deportment, though invariably courteous and king to all, she seemed to feel that her sphere of usefulness was especially the home circle, and there her worth was duly appreciated, and this bereavement is justly esteemed in irreparable misfortune. Her simple memorial—a devoted wife and affectionate Mother, is inscribed on the hears of those who the very last were objects of her tender solicitude and untiring care. 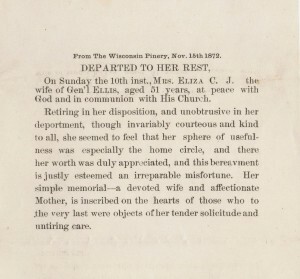 Eliza (Breuninger) Ellis death notice, private collection of the author. My heart is too full to write: five [?] children are sick with whooping cough: one at least not expected to live. 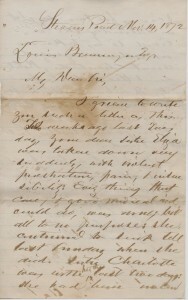 Letter and envelope from Albert G. Ellis to Louis Breuninger, informing Louis of the death of his sister, Eliza. 1872. In private collection of author. Albert G. Ellis married Eliza C. J. L. Breuninger on 19 August 1847 in Brown County, Wisconsin. (Brown County Marriage Record, Vol. 1:22, Wisconsin Historical Society.) This was Albert’s second marriage. It is interesting to note that Eliza and Louis Breuninger’s father was a school teacher in Germany and that the teaching tradition was carried on in the Ellis family. There was evidently some musical talent in the family, too, since a couple of Eliza’s children were music teachers. Imagine music teachers in the mid-1800s. There is a reference to an instrument that Louis made in one of the letters. In addition, one of the Ellis daughters was an artist who painted the oil portrait of her father. I wonder which daughter painted that portrait? And as usual, other questions arise: When did Eliza and her sister Charlotte immigrate and how did Eliza meet Albert Ellis, who was 20 years older than she? What about Eliza’s sister, Charlotte Kitchen? 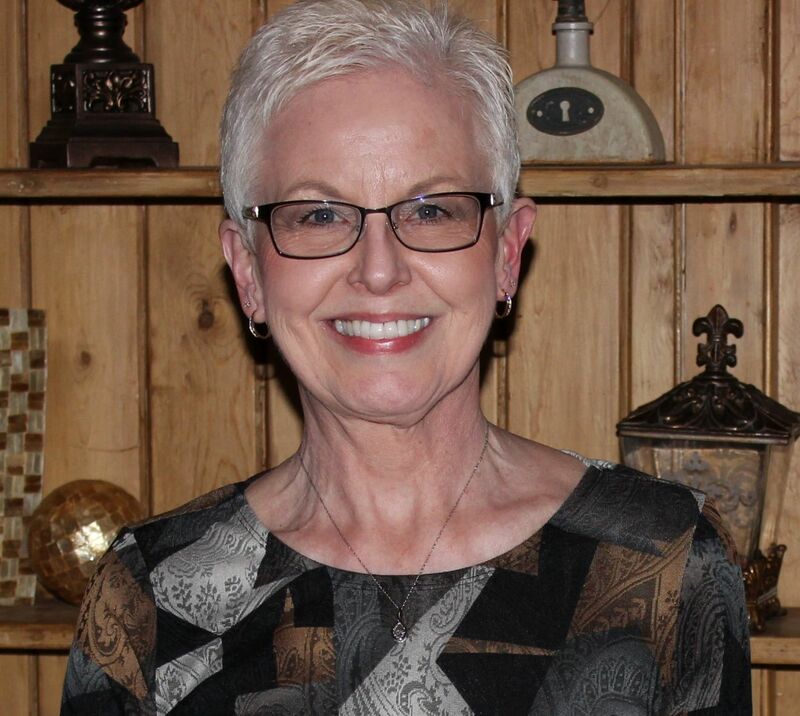 Who was Lora Breuninger? Another sister? More from The Breuninger Collection in upcoming blogs. my grandfather charles Breuninger Is from Wurttemburg Germany and his son Charles Is from Wisconsin and settled in Oklahoma. By chance same one? Possibly. My Louis had a brother Carl Ludwig (1818-? ), born in Wuerttemberg, lived in Green Bay. I contacted one of his descendants several years ago and he said Carl had children Henry Bernard and Caroline. Henry Bernard married Elizabeth and one of their children was Henry Charles, born in 1888. Henry Charles married Elizabeth Rothe. Is this your line? If so I would love to share information. Thanks! I was pleasantly surprised to come across your website, particularly in regards to the Ellis and Breuninger family connection. Years ago I intended to write a biographical treatment of Mr. Ellis’ life, and in the normal course of research gathered genealogical information on both the Ellis and Breuninger families. 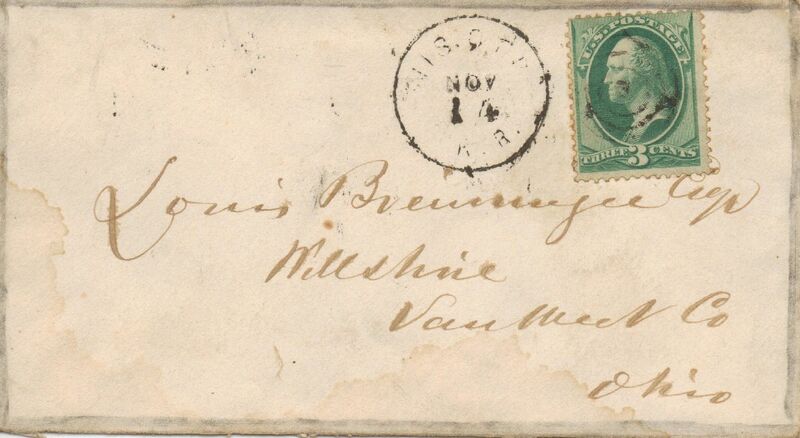 Lewis Breuninger and his brother Karl (Charles) came to the US in April, 1840, landing at the port of New York. Karl then spent a year in Delaware, moved to Ohio for four months, and finally settled at Green Bay, Wisconsin. I presume Lewis accompanied his brother Karl through this family sojourn, but I am not sure. Did Johann and Eliza CJL accompany them? Perhaps. I don’t have that information. Both Karl and Lewis, as you know, were born in Shrotsburg, Wurtemburg, Germany, sons of Johann (John) Breuninger and Sophia C. Phaff (Sophia was born February 17, 1800 in Hermersberg Castle, and died October 9, 1834 at Kocherstertien where also did her husband Johann). Karl married Sophia Huenger. He died at Green Bay March 3, 1866. Charlotte Breuninger was born August 25, 1824. Charlotte came to the US in 1848 to join her brothers and sisters. 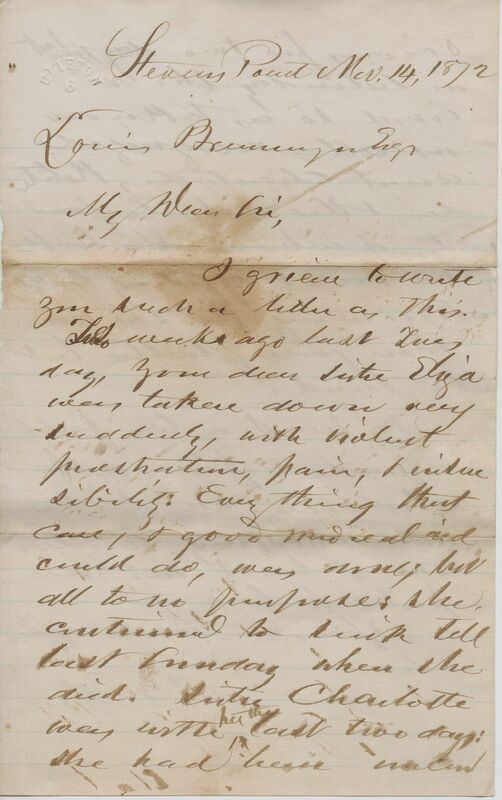 A year later she married Charles Kitchen at Green Bay October 9, 1849, he having settled at Green Bay in June of 1836. Charlotte died unexpectedly in Green Bay on December 28, 1876. And Mr. Kitchen died in the spring of 1881. They had two sons and four daughters (I have further family information on their children). Charlotte’s marriage took place at the home of Mr. Ellis. During this same year, 1849, a Frederick Breuninger advertised “Lessons in Music”, with his temporary residence at the home of Mr. Ellis. I presume he may have been Johann Friedrich Ernest Breuninger as you have listed. I don’t know, but I think a good supposition. Mr. Ellis married Eliza CJL, as you know, August 19, 1847. They had nine children—eight girls and one boy. She died in 1872. Unfortunately, I have almost nothing further concerning Eliza CJL. The “oil portrait” of Mr. Ellis you included on your website is a curious item. Mr. Ellis, in one of his letters, states that he could not afford a sitting with a portrait artist. Instead, a photograph of Mr. Ellis, taken about 1850, was used, and Mr. Ellis’ daughter Pamela applied the colorful oil paints over the image in 1876. Many years later (perhaps in the 1960s or 1970s) this photographic image of Mr. Ellis was again “recaptured,” using camera filters to obtain a very fine “reverse” image from the backside of the “oil portrait”. Mr. Ellis came to Green Bay September 1, 1822, arriving on the schooner Superior. He was, at that time, a young clerk to a missionary of the New York Indians, recently removed to the Green Bay area. Mr. Ellis, in 1824-1826, taught school in the fledgling frontier village. The local commander at Fort Howard provided rooms for Mr. Ellis’ services at the fort. With the background of the Breuninger family members as teachers, etc., I think the marriage of Mr. Ellis to Eliza CJL was a serendipitous coming together, their “cultural genes”, so to speak, having been passed on to their children. Having spent many hours rummaging around in archival dust, scanning through endless miles of microfilm, etc. I became very familiar and proficient in deciphering Mr. Ellis’ orthography. I can, if you wish, supply the missing words and phrases to the 1872 letter you’ve provided on your webpage, and perhaps that of the second letter you have in your possession. If you have any further questions, I freely invite you to contact me. Hi Karen! Had a correction to make and that is my grandfather Charles Breuninger ‘s son was William Breuninger from Green Bay Wisconsin area.Having done some genealogy research on Ancestry it does not list any ancestors past Charles Breuninger. Really believe he must be related to your family as they both came from Wurttemburg area and settled in Green Bay area. Charles was married to Joanna Blanchard a menominee indian.Still digging for some family members and thanks for your Breuninger blog. I really enjoy it. Found the connection! Johann Frederich Martin Breuninger and Sophie Pfaff/Graff are my great great grandparents and they are Charles Breuninger’ parents. are you related to Charles? I’m related to in succession: Charles, William, August, Douglas, Douglas jr.
Can you give me your resources that relate to JFMB and SP / G please? Dear Karen; Sorry to have hijacked your Page!